Today we solemnly celebrate the name of our Venerable and God-bearing Father Sergius, the Abbot of Radonezh and Wonder-worker. 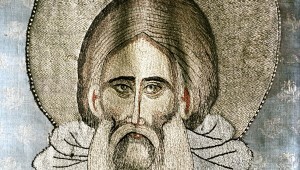 The Venerable Sergius is an extraordinary example for all of us, for the Church, and for our people ­– an example of how the Divine commandments can be realized in the person of a human being; of how a human being possessing weaknesses and illnesses, bound to the physical existence of this world, can attain likeness to the angels. Every believing person from time to time has the following thought: is it at all possible to attain this Divine likeness in our modern world? Reading the Life of the Venerable Sergius will convince anyone that this was indeed a great man; this was a happy man. The Venerable Sergius never complained, even in the most constrained circumstances of life: when he lived in solitude in the dark woods, when he was starting this holy monastery; and when he, misunderstood by the brethren, had to withdraw from this monastery and live, as it were, in exile from his brethren; and in the days when extraordinary danger surrounded both the Church and the country. Nowhere is it mentioned that the Venerable One was dissatisfied, annoyed, or angry with anyone, trying to correct something with human strength. His Life bears witness to us of a wise, spiritually strong, beautiful person — indeed, an extraordinary example for us. What will help us understand the mystery of such a life? How did such a way of life begin, and how was it maintained? We read remarkable texts of Holy Scripture in connection with the memory of Venerable [monastic] Fathers. Everyone knows well the words of the Gospel according to Matthew that resounded yesterday at Matins: Come… and learn of Me, for I am meek and lowly in heart. And then what? And ye shall find rest unto your souls (Matthew 11:28-29). The Lord associates meekness and humility with inner peace, and we know that peace is a synonym for human well-being. One can be rich, famous, and powerful; one can be a hierarch, priest, or minister — whatever — and if one does not have inner peace, one cannot have well-being. Modern life shows us amazing examples of how people who have attained the heights of political life, who have become very rich, super-rich, cannot attain this peace. Why not? Because we live in a world where sin abides and where various feelings arise in human hearts in regards to other people. For instance, you are all very familiar with the feeling of envy, which deprives man of peace. The envious person seeks ways of punishing the person who evokes envy in him by depriving him of his position, of money, of family well-being, or of the respect of others. The realization of this desire requires action: one has to come up with a plan; perhaps one needs to get people on one’s side or organize an entire battle plan. But where is there peace? Instead there is agony and woe! But if something goes wrong, such people gnaw at their hands and wipe away tears of anger. Sometimes it happens that someone is not at all envious, but simply does not like another person’s life. He thinks that he is doing better than the other person. Again battles begin, moving from hidden intrigues to open action. If one looks, on the other hand, at ordinary human conflict — sometimes it happens that someone offends us, speaks badly about us, expresses disagreement with us, or even starts a battle against us — what do we usually do? We concentrate our energies on striking a blow against that person in order to lessen potentially harmful actions on their part. We wrack our brains, lose all peace, and try to look for allies; sometimes publically — and in our times also through the means of mass media — we involve ourselves in argument and conflict. We should not do any of this if we want to be happy. If we want to have peace, we need to learn to bring our opponents and enemies before God’s judgment. If we feel that we are right, then the first thing that we should have in a difficult life situation is the conviction that only God is the true judge. He clearly sees the depths of the human spirit, and if one person or another truly becomes our enemy, and we do not desire this or give cause for this, then we need to pray sincerely for this person and ask that God’s judgment be accomplished and not human judgment. God’s judgment overtakes people who perform evil deeds more quickly than we can possibly imagine. If it happens more slowly, then this is for our salvation, for our humility, and for our patience. The main thing for us is not to falter. If a man be overtaken in fault, ye which are spiritual, restore such an one in the spirit of meekness — we just heard these words from the Apostle Paul’s Epistle to the Galatians (6:1). Finally, today’s Gospel reading: Blessed are the poor in spirit (Luke 6:20) — that is, those who are controlled not by their own selfishness, but by God’s power; those who give over their own “I” to God and God becomes the center of their life. Blessed are the meek; blessed even are they that mourn (cf. Matthew 5:4-5; Luke 6:21). But nowhere is it said that blessed are they that are able to defend themselves, who are able to counter-attack, who are able to make their way to success in life. Meekness and humility is a great force that helps not only to guide the world according to God’s law, but also helps man to find peace and, along with peace, health. What do people fall ill from the most today? From stress, from nervous tension. But if one looks for the cause of this stress — one does not need to go to any psychotherapist — the source of all this is human sin, because without sin there would be no illness. The modern world and contemporary society clearly show us this connection between illness, unhappiness, and sin. The Venerable Sergius looks at us today from his icon, from the depths of the ages, with his meek countenance, as if striving to show us how we should live. 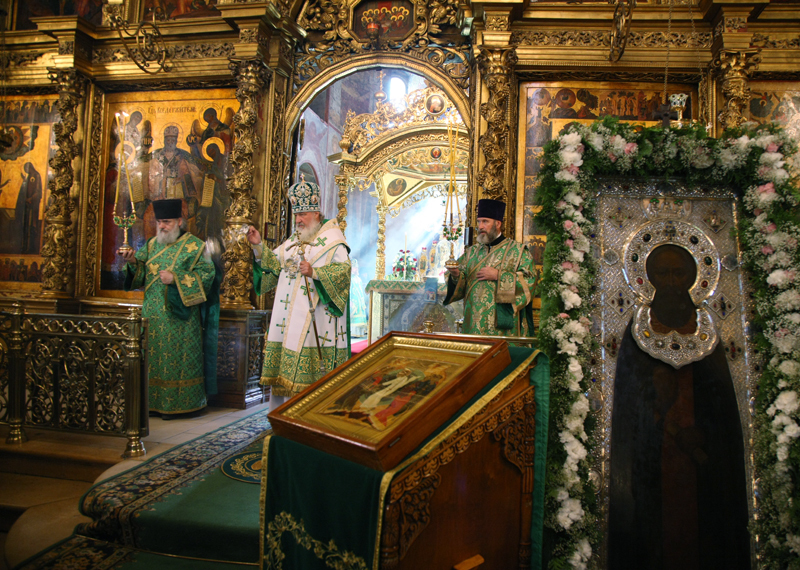 We have come to his Lavra to venerate his relics; we feel the help that comes from the Venerable One. 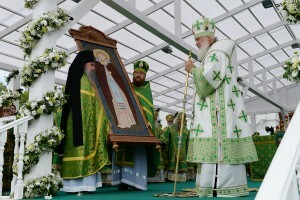 So let us believe in the way of life he led, becoming through his meekness and humility a great spiritual leader of our people, and not only for the distant fourteenth century, but for the generation, restless in sin, of the twenty-first. The Church is a community that, following the Savior’s example, heals people. The Holy God-pleasers are examples of this healing, which is caused by the victory of man over his own restless spirit. And may the Lord help us so that we, looking at the meek countenances of the God-pleasers, would recognize a great and eternal truth: Come unto Me and learn of Me; for I am meek and lowly in heart: and ye shall find rest unto your souls (Matthew 11:29). 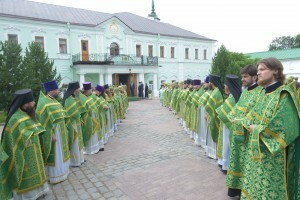 Delivered at the Trinity-Sergius Lavra on July 18, 2009.